By Michael Vaughn. (2017/352 pp). 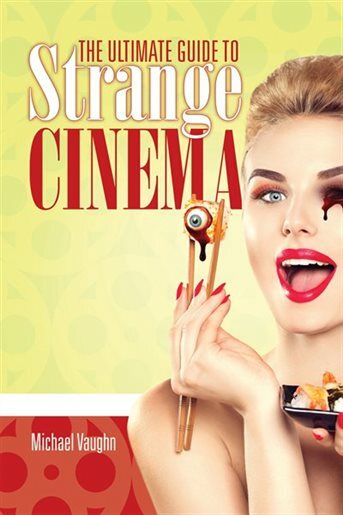 At first glance, one might understandably assume The Ultimate Guide to Strange Cinema is yet-another book dedicated to cult films. After all, most movies embraced by the fringe crowd are indeed strange and you'll find a lot of them discussed among these pages. But author Michael Vaughn has a different agenda than providing the umpteenth shout-out to The Rocky Horror Picture Show. In fact, Vaughn only fleetingly mentions that cult classic when discussing some lesser-known films, such as its spiritual precursor, Phantom of the Paradise, or Rocky Horror's completely forgotten sequel, Shock Treatment. In addition to films with indisputable cult credentials, there are detailed write-ups of obscure titles from around the world - bizarre Japanese mash-ups, Italian giallo & gorefests, high falutin' art films, crazy classics, microbudget massacres...even some major Hollywood movies that also happen to be really, really weird. Some entries include interesting trivia footnotes and brief interviews with people involved in the production. Movies are grouped in chapters by category and, for some genres, further broken down by country of origin. Vaughn's knowledge and enthusiasm for the subject is readily apparent, his writing style displaying great fondness for most of these films (even made-for-TV cheapies like Killdozer). Though he occasionally misuses an idiom or two and a few of his facts can be disputed (no reference book is perfect), The Ultimate Guide to Strange Cinema lives up to its title. Chances are even the most dedicated fan of off-center entertainment is likely to learn of a few movies they never knew existed.